Here's our collection of dragon colouring pages - including Chinese dragons for Chinese New Year, Welsh dragons for St David's day, fierce dragons for St George's Day and fairy tale dragons for a fairy tale theme! What a magnificent Chinese dragon this is! It's a wonderful colouring page for older kids - you can turn it into quite an intricate design. We have two dragons below, looking in different directions so that you can colour a matching pair if you wish. Dragons are one of the first creatures that come to mind when we think about Chinese mythology - here's a lovely dragon for the children to colour in for Chinese New Year. Here's a fantastic dragon colouring page to print and enjoy. 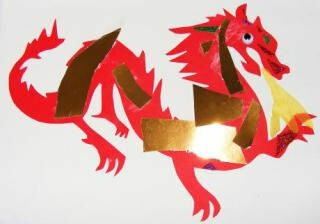 He's perfect for Chinese New Year or St George's Day - or any time a dragon is required! Here's a very stylish Chinese dragon colouring page to print and enjoy. Celebrate St George's Day with some patriotic colouring pages - and of course a colouring page of St George slaying the dragon! Here's a beautiful colouring page for Year of the Dragon people - perfect for older children to colour in. how about framing it to display in the room of a child born in a dragon year?